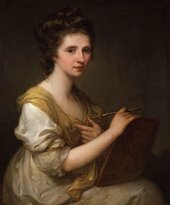 Maria Anna Angelika Kauffmann (30 October 1741 – 5 November 1807), usually known in English as Angelica Kauffman, was a Swiss Neoclassical painter who had a successful career in London and Rome. Remembered primarily as a history painter, Kauffmann was a skilled portraitist, landscape and decoration painter. She was one of the two female founding members of the Royal Academy in London in 1768.